The opioid crisis has affected people across the country. 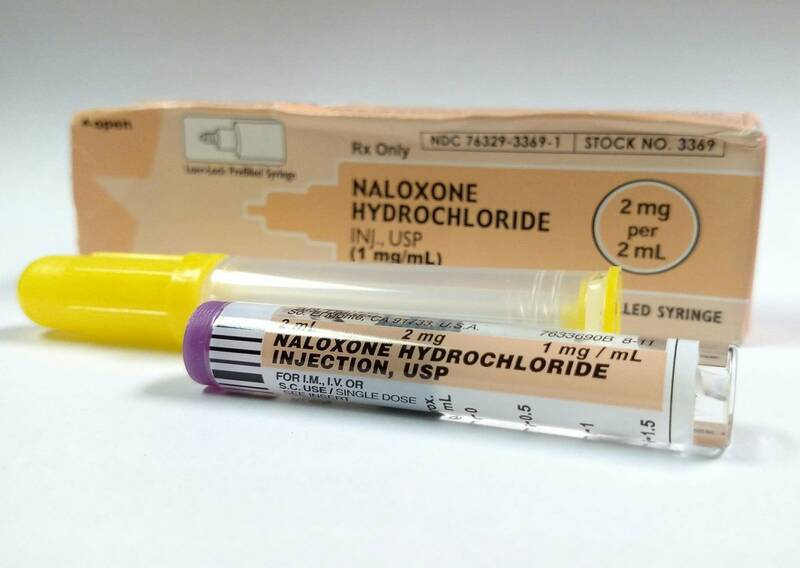 Naloxone, or Narcan, can help revive people who are suffering overdoses. In 2017, opioid-related deaths reached 47,600—six times as many as in 1999. Public health officials have sounded the alarm and politicians across the spectrum have identified opioid abuse as a national crisis. The opioid crisis now lowers life expectancy more than firearms or motor vehicle accidents. Furthermore, the crisis is especially deadly to young and middle-age people. Here are four things you should know about the opioid crisis unfolding across the United States. 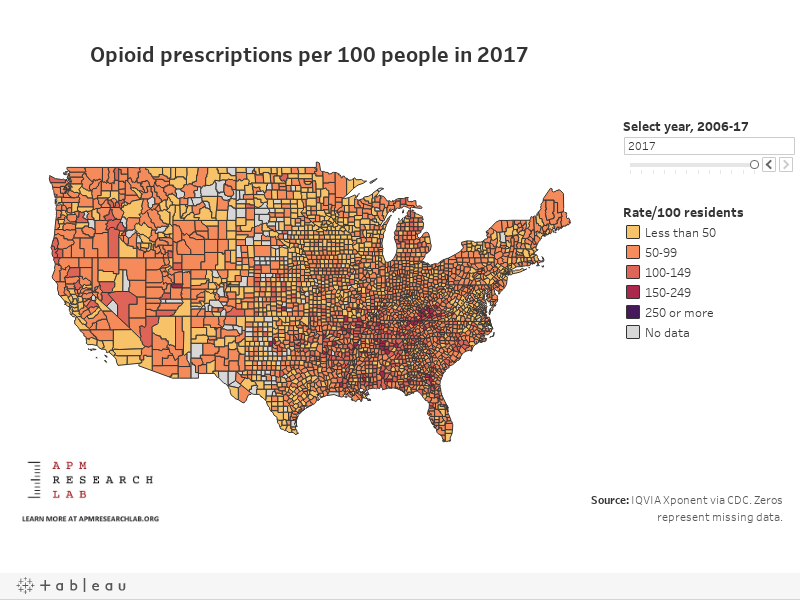 The interactive below shows the retail opioid prescribing rate by county per 100 residents in 2017 (see our project page for more trends and geographic analysis). There is a clear geographical concentration in the Southern U.S. and Appalachia, with some counties reaching an alarming 200 prescriptions per 100 residents. Going back to earlier years reveals even more extreme results, with some communities reaching nearly six prescriptions for each resident. According to the Centers for Disease Control and Prevention, opioid prescription rates reached their highest point in 2012, then steadily decreased throughout 2017 (latest data). Despite this, prescription rates remain high in many counties, notably—but not at all solely—in Appalachia and other parts of the Southeast. While opioid prescription rates have declined somewhat in recent years, the death rate associated with those prescriptions has stayed high and even crept up. Overall opioid-related mortality rates have steeply increased due to the two other factors: first heroin-related deaths, which are now nearly as common as prescription related deaths, and the even more recent and dramatic increase in deaths due to synthetic opioids. Synthetic opioids now account for nearly as many deaths annually as prescription opioids and heroin related deaths combined. According to researchers from the University of Colorado School of Medicine, the rapid increase in deaths due to synthetic opioids has hit the Eastern U.S. particularly hard. Among twenty-eight states in the East, the rate of change has been staggering—their mortality rate due to synthetic opioids at least doubled every two years between 1999-2016. The researchers stressed that these opioid-related mortality rates may even be under-reported due to misclassification. Over-prescribing of natural and semisynthetic opioid painkillers led to increased deaths from the late 1990s to around 2010. As prescriptions ran out, patients turned to heroin leading to a surge in heroin-related deaths. Beginning in 2013, “illicitly manufactured synthetic opioids” such as fentanyl began to enter the market, causing a rapid increase of overdose deaths. The nature of these “intertwined epidemics”—over prescription, the surge in heroin deaths, and the rise in synthetic opioids—underscore the importance of evidence-driven policymaking to help solve the crisis. Policymakers need to consider two facets of the crisis: addiction management and emergency overdose response. The CDC has published prescription guidelines for providers, but it is equally important to consider the demand side of the equation. Some states have had moderate success with harm-reduction strategies like needle exchange programs and police access to naloxone (commonly known as “Narcan,” the brand-name of the emergency narcotic used to reverse overdoses). Addiction management and harm response are but two of the strategies that policymakers and communities should consider. Opioid-related mortality is a major public health crisis that must be solved with effective, evidence-based policy interventions. Visit our project page for more analysis and to learn about geographic hotspots in the opioid crisis. This article was authored by Josh Quinn, Research Assistant for the APM Research Lab. Josh is completing a Master’s of Public Policy degree at the Humphrey School of Public Affairs.